Published April 8, 2013 at 154 × 244 in Magic Trash by Gertie Poole. 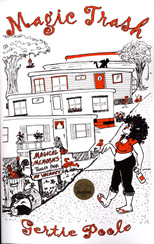 Magic Trash: Hattie Mac screwed up and she is banished to the Magic Memories Trailer Park in Florida. She is band from using magic ever again. Hattie’s indiscretions cost her a fortune in fines and years added to her sentence. Very fun story written by the author of Realm.